Did you know that almost half of Google searches are local, not a standard informational search? Our recent infographic, “Local SEO: Make ‘Clicks’ Lead to Your ‘Brick’ Location” delves into how local search engine optimization can impact brick-and-mortar store visitation. Local SEO (search engine optimization) is the practice of improving your online presence to attract local customers to your brick-and-mortar business. Forty-six percent of all Google searches are local, and there has been a 900%+ growth in mobile searches for “_____ near me today/tonight.” Among the people who searched for local businesses, 76% visited a related business within a day, and 28% made a purchase. With so many consumers searching for local businesses, it’s important to make sure your business comes up in those searches. In order to take advantage of these local searches, you have to ensure your business is on Google and that your local SEO is good enough for people to find you. Here are three steps you can take to improve your local SEO. When people search for companies, they want to be given the necessary information instantly. Ensure the following is easily accessible on your Google listing, website, directories, social media and any other platforms you have. 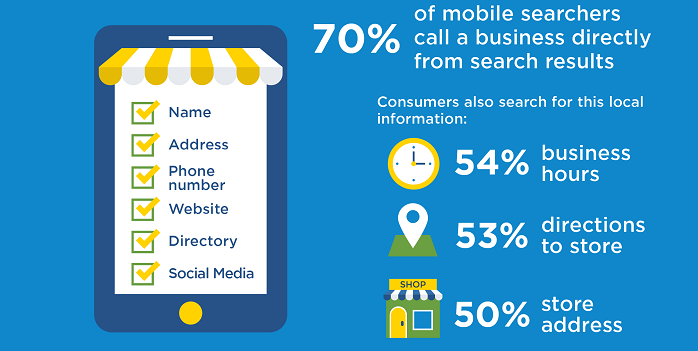 Seventy percent of mobile users call a business directly from search results, so make it as simple as possible for potential customers to get in contact with you or your business. When you make your business information easily accessible online, you not only give consumers the information they want, you increase the chances of them visiting your store. These online directories are among the top search results, so it’s vital that you claim your small business on these sites in order to boost your local SEO. Eighty-six percent of consumers read reviews for local businesses, and on average, consumers read 10 online reviews before feeling like they can trust a local business. Among those that read reviews, 89% read businesses' responses to reviews. In order to convert these consumers, make sure you encourage former customers to leave reviews and respond in an authentic way to show future consumers how you interact with your customers. Even if you receive a bad review, respond by addressing any issues the customer had and offer to resolve the issue on a different platform. This shows potential customers that your business cares about its patrons. If you’re looking to boost your local SEO but are unsure where to go from here, work with a SCORE mentor to help improve your local marketing strategy. We would love to help your business rank for local searches and bring in more customers!